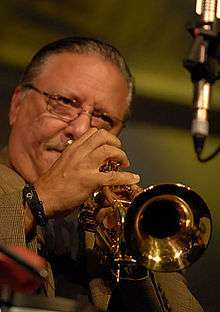 Arturo Sandoval (born November 6, 1949) is a Cuban jazz trumpeter, pianist and composer. He was born in Artemisa, Cuba. Sandoval, while still in Cuba, was influenced by jazz musicians Charlie Parker, Clifford Brown, and Dizzy Gillespie, finally meeting Gillespie later in 1977. Gillespie promptly became a mentor and colleague, playing with Arturo in concerts in Europe and Cuba and later featuring him in The United Nations Orchestra. Sandoval defected to the United States of America in Spain, while touring with Gillespie in 1990, and became a naturalized citizen in 1999. Sandoval's life was the subject of the 2000 TV film For Love or Country: The Arturo Sandoval Story, starring Andy García as Arturo Sandoval. He currently resides in Tarzana, California. Sandoval has been awarded 10 Grammy Awards, and nominated 17 times; he has also received 6 Billboard Awards and one Emmy Award. 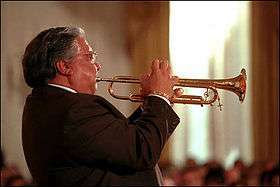 On August 8, 2013, President Barack Obama announced that Arturo Sandoval would be a recipient of the Presidential Medal of Freedom. Sandoval associated with many musicians, but the most important is Dizzy Gillespie. Gillespie, a longtime proponent of Afro-Cuban music, has been referred to as a "spiritual father" by Sandoval. When the two trumpet players met in Cuba in 1977, Gillespie was playing impromptu gigs in the Caribbean with Stan Getz. Sandoval later said, "I went to the boat to find him. I've never had a complex about meeting famous people. If I respect somebody, I go there and try to meet them." Sandoval's albums feature over 200 of his own compositions and arrangements, highlights including "A Mis Abuelos", which received Grammy nominations for Best instrumental Composition and Best Arrangement. This composition was featured on his Grammy award winning album Danzon. Other highlights from Sandoval's discography featuring his compositions include: Dear Diz Every Day I Think of You (2012) Live at the Blue Note (2005), Rumba Palace (Grammy 2007) and Hot House (Grammy 1998). When HBO Films, developed a movie based on Arturo Sandoval's life, he was asked to score the movie, which earned him his first Emmy award. In 1996, Sandoval was commissioned by the Kennedy Center Ballet to score Pepito's Story, a ballet based on the book by Eugene Fern and choreographed by Debbie Allen. Sandoval also composed a classical trumpet concerto that he performed and recorded with the London Symphony Orchestra. Sandoval's compositions and performances can be heard in The Mambo Kings, which was nominated for a Grammy in 1992 for Best Instrumental Composition written for a Motion Picture or for Television.